From Sled Solutions, "2 years ago Chris Burandt came to me and said "build me a bag that doesn't hang off the tunnel". Up for the challenge we set out to build a bag that would fit his style of riding. Trees, deep powder and big enough to carry his essentials. We developed a bag that does all of those things and Chris tested it for 2 season. The result, E-Series Backcountry bag made in the U.S.A."
This underseat snowmobile bag fits any Polaris 136" track or longer from 2008 through 2013 with the hoop seat support and standard length seat. The Sled Solutions E-Series Backcountry bag features tool-less installation, plastic tray bottom, one main compartment and two side compartments, internal mesh pocket on zippered door, an internal pocket for float air pump and is 99% waterproof. 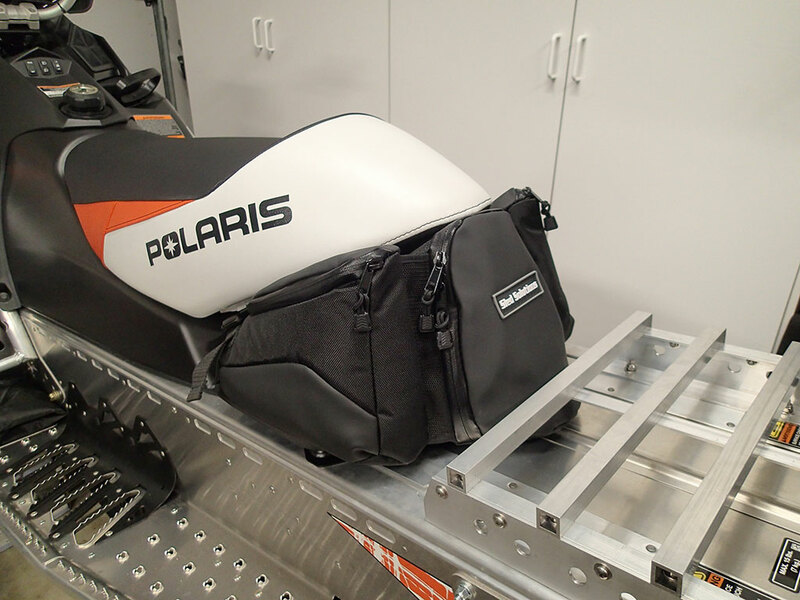 This snowmobile underseat bag completely fills out the underside of Polaris freestyle seats yielding lots of usable storage space. When I bought my 2013 Polaris 800 Switchback Assault I knew I would need some type of storage solution to keep essentials like a first aid kit, tow straps, drinks, etc. My old snowmobiles had storage areas built into the seats, so an underseat bag seemed like a logical solution for my new sled. I don't like the design of the small Polaris-made underseat bags, so I turned to the E-Series Backcountry Bag by Sled Solutions. I will admit I was initially turned off by the price tag of the E-Series Backcountry Bag, but then again what isn't expensive in the sport of snowmobiling? After dropping over $11,000 for my new sled, what's another $140? Luckily the E-Series Backcountry Bag screams quality, function, and durability, making the price easier to swallow. The underseat bag arrived direct from Sled Solutions in a timely manner. It was very simple to install on my snowmobile and feels very secure. I like the design, as it is sized to perfectly fill all the space under my Polaris freestyle seat. The capacity of the E-Series Backcountry bag is perfect for my needs. I have my first aid kit, tow straps, and spare spark plugs in the main compartment. There is still plenty of room left to add more essentials. 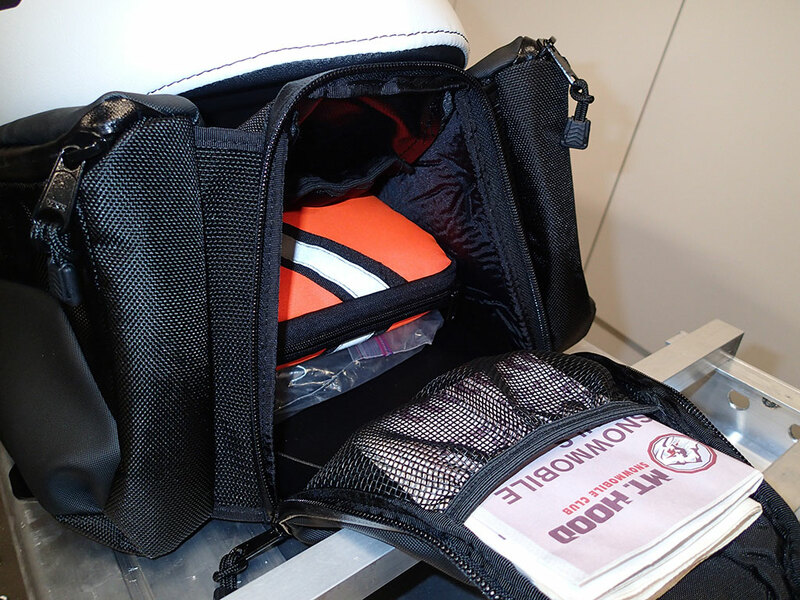 Each of the side compartments can hold 3 sodas or 2 water bottles, making the underseat bag perfect for a full day of riding. The zippers on all of the compartments are of a waterproof design and the main fabric is coated to shed water and snow. 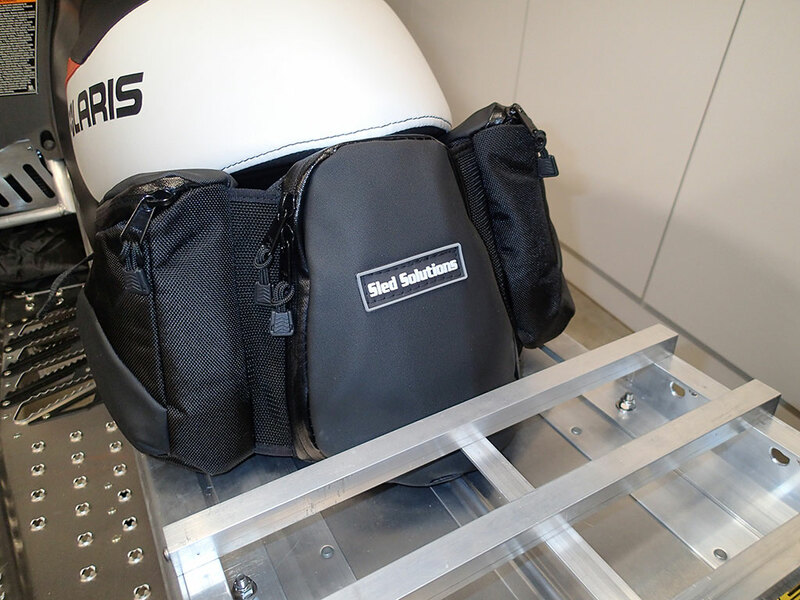 The Sled Solutions E-Series Bag is a perfect complement to my Polaris snowmobile and I look forward to seeing how it performs this season. We finally received a taste of winter up near Mt Hood giving me the opportunity to test out the E-Series Backcountry underseat bag. I loaded up the two side compartments with drinks and set off for a fun day of riding. While the snow was not always deep, the E-Series Backcountry bag performed consistently. My drinks were easily accessed and the contents in the main center compartment stayed secure and dry. I don't know of anything more I could ask for in an underseat storage bag. The E-Series bag was never in my way, but made it very convenient to access stored items. I like how it looks on my sled and look forward to many more trips with the E-Series Backcountry Bag. 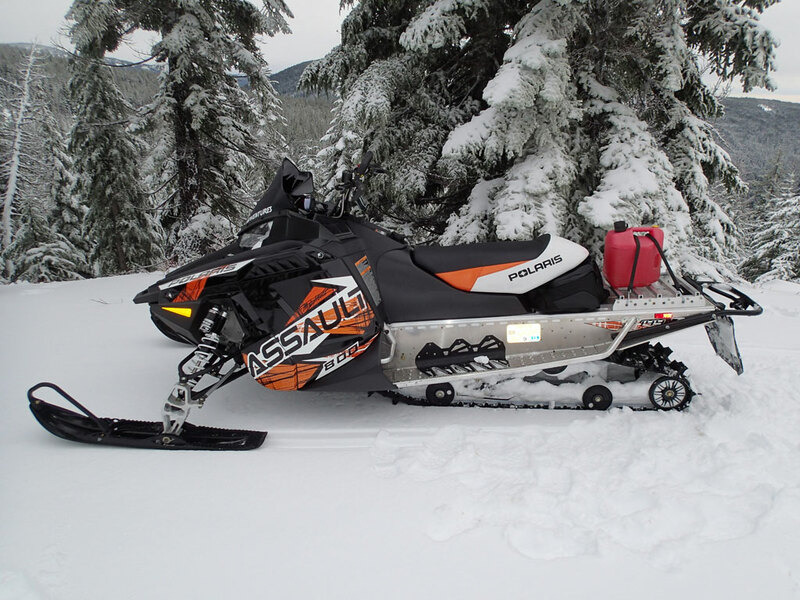 See Snowmobiling to Badger Lake and Bonney Meadows adventure where the E-Series Backcountry Bag was used. Now that I have been using the E-Series Backcountry Bag from Sled Solutions for two seasons, I can't live without it. It still looks new besides a small area on the bottom that shows rub marks from a rough rivet on the tunnel of my Polaris snowmobile. I love how I can keep essential items like tools and first aid supplies always packed in the underseat bag ready for my next trip. And there is still room for drinks and snacks. The contents are always dry and readily available. The E-Series Backcountry bag fits so well on my sled that I hardly notice it is there until I need something stored inside. It still fits even with a seat jack installed for those times I want to bring a small passenger along. See Bonney Meadows, Frog Lake Buttes, and Badger Lake adventures where the E-Series Backcountry Bag was used. 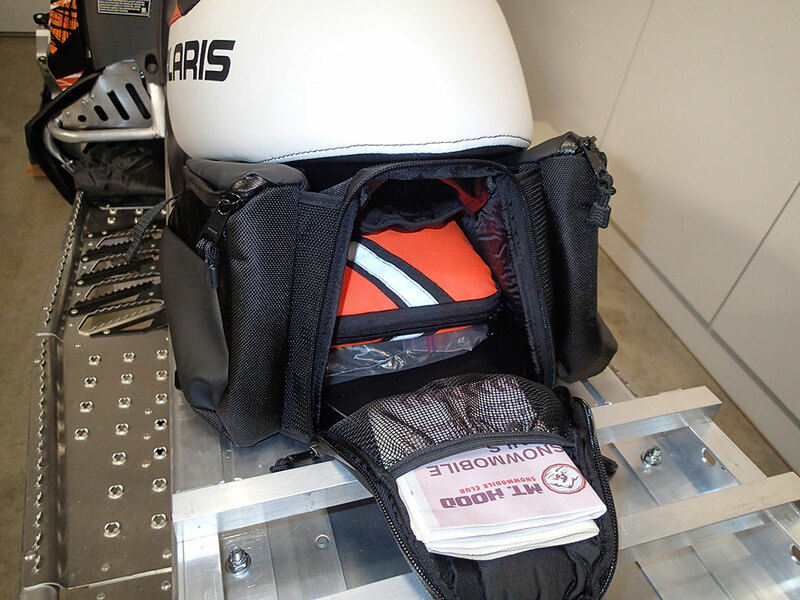 I am thoroughly impressed with the Sled Solutions E-Series Backcountry underseat bag for my Polaris snowmobile. It is durable, practical, and compliments my sled. In my opinion, it is the best underseat bag currently on the market.